Just in time to follow closely upon yesterday’s European circus, IHS Markit piles on with more of the same forward-looking indications looking forward the wrong way. Mario Draghi says the ECB is ending QE, good for him. The central bank will do this despite balanced risks rebalancing in a different place. The more bad news and numbers stack up, the more “they” say it’s nothing just transitory roughness. Markit’s Composite PMI for the Eurozone suggests more imminent prospects, the lowest in 49 months, more than four years says so; as does the very clear trajectory. But that’s just Italy and France, the places we see on the news screwing up the otherwise rocking good times everywhere else. What was Germany’s composite? Slightly better, actually, it was the lowest in 48 months. Though at 52.2 it has largely confirmed the country’s negative Q3 GDP may not have been the temporary imposition of emissions and drought, after all. If these balanced risks balancing otherwise was strictly a European rebalancing there would still be references to decoupling. There aren’t because it hasn’t ever happened. The US boom isn’t much talked about of late for the same reasons as the ECB’s yesterday spectacle. 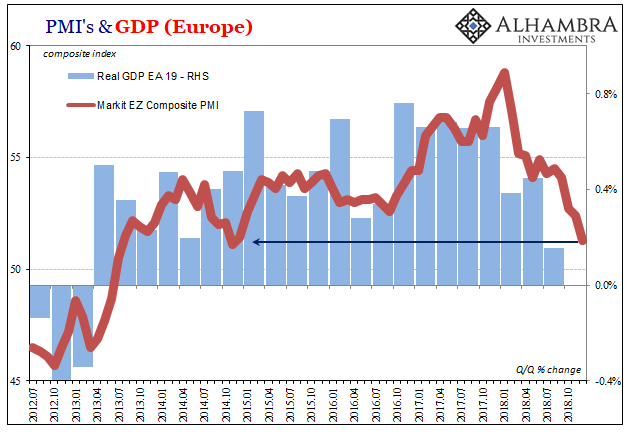 Global synchronized growth is dead so it makes sense when it died global synchronized decline has replaced it. This is why governments should not try to run the economy too much. They do a terrible job of it.